FORT ZACHARY TAYLOR HISTORIC State Park, known simply as Fort Zach to locals, has gained a reputation as the best beach in Key West (with half-hearted apologies to runners up Smathers and Higgs beaches — there’s always next year, guys). Fort Zach’s beach area is one of the most photographed aerial landmarks of Key West: a white sand crescent dotted with tropical evergreens, bordered by a vast gradient of blue-green ocean and boasting a highly-snorkleworthy reef. With the annual visitor count routinely topping out at 500,000-plus, the 87-acre park is clearly a big draw for day-trippers looking to deepen their tans, spot a stingray or simply watch the party boats go by. But it’s the trapezoidal stone fortress just a five-minute stroll from the beach that truly sets this park apart. After the embarrassment of seeing its East Coast harbors easily overtaken by British forces during the Revolutionary War, the United States government set out to implement a more secure system of coastal defensive strategy. Under the advisement of a lofty French military engineer (whose résumé boasted former employment with a little-known French emperor by the name of Napoleon), a proposed series of maritime fortresses was drawn up. It fell to Col. Joseph G. Totten to oversee the project. series of stone forts overlooking the Atlantic Ocean. Twenty-four years in, Col. Totten realized a potentially dire tactical error had been made: An extensive study of our country’s eastern marine border had erroneously deemed Florida’s coastline lacking any deep-water harbor, and as such, no plans for a fortress had been made for any city south of Pensacola. While Key West had for years been home to various military garrisons, the city had been gravely overlooked during the original evaluation of defendable harbors. A subsequent inspection deemed the southwest point of the island to be the best location for a fortress. 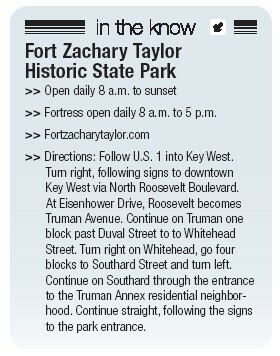 And thus the construction of Fort Zachary Taylor was begun. Unfortunately, it would be another 30 years — on Nov. 3, 1866, to be precise —before construction of Key West’s fort would conclude. Decades of inefficiency, plague, extreme weather and human rights abuses would mar the years between the conception of Fort Zach and its anticlimactic completion. The fort was technically never finished; when the bombardment of Fort Pulaski, Ga., by Union forces completely demolished that building, it spurred a shutdown of fortress construction nationwide. From the moment its construction was approved, Fort Zach proved to be a daunting task for its overseers. The difficulties of sourcing enough granite and brick from New England, coupled with Key West’s annual affliction with yellow fever, meant that building could not continue uninterrupted for very long. The work was grueling, the wages abysmally poor; to accomplish the most back-breaking work, local slave owners “rented” out their men, whose work earned their masters $1 per day. A hurricane in 1846 reduced the job site to rubble and set the project back a full year. And every summer when yellow fever spread quickly in the tropical heat, it was only due to increased rations of whiskey and quinine that those laborers working to finish the fort could be persuaded to stay. 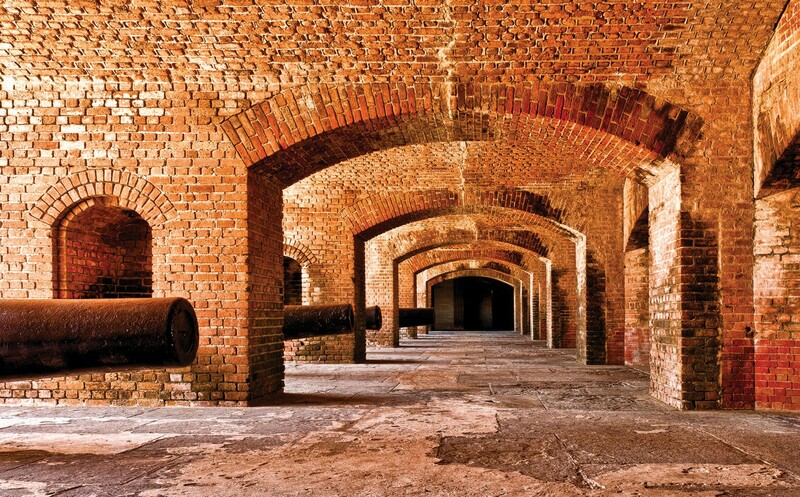 Due to a belief that the disease was caused by an accumulation of stagnant air, cannons were frequently set off to create movement in the atmosphere inside the fort, while barrels of tar were hung above the barracks and set ablaze in an effort to aid the movement of stale air outward. It was, as you can imagine, an unpleasant place to live and work. The (never used) 10-inch cannons had a range of three miles when fired. 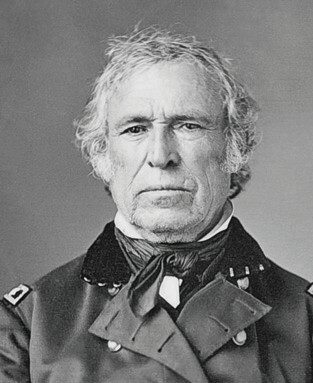 By 1850, the project had progressed far enough to receive an official name: Fort Zachary Taylor, in honor of the recently deceased U.S. president, whose brutal success in Florida’s Second Seminole War 13 years prior had earned him the command of all American troops stationed in the state of Florida. As civil war grew nearer on the horizon, attempts to speed up the completion of the fort were prioritized by leaders in Washington. They dispatched enlisted servicemen from the Company A Corps of Engineers to Key West to aid in managing the project, attending to the delivery of massive shipments of ammunition and weapons, as well as the construction of a desalination plant on site to provide large amounts of drinking water. An ingenious sanitation system that harnessed wave power to flush away waste was installed and, finally, a small makeshift bakery was added to provide rations for the troops on site. By early 1861, the fort, though still far from finished, was fortified enough to receive the entire Key West barracks. Meanwhile, in Alabama, Florida politicians convened with representatives from five other southern states to form what would soon be known as the Confederate Government. Within a month, all federally funded forts in the south had been seized by Confederate forces with only four exceptions — one being Fort Zach. On Jan. 14, 1861, a battalion of heavily armed troops from the 1st U.S. Artillery led by Capt. John M. Brennan marched into the fort along with a handful of civilian workers and claimed it officially on behalf of the North, raising a Union flag to symbolize their peaceful occupation of the fortress. The Key West fort remained a Union stronghold for the entirety of the Civil War, acting as headquarters of the U.S. Navy East Coast Blockading Squadron. During the Spanish-American War, the design of the building was augmented to accommodate heavier artillery, fortified by the addition of poured cement (which buried many of the original cannons until 1968, when excavations revealed the cache to be the largest in the nation). The fort continued as an active coastal fortress throughout World War I and World War II, after which it was demilitarized and given to the Navy for scrap metal storage. After dredging projects in the 1960s solidified the space between the fort and the beach, excavations on the interior fort walls were begun, the results of which were so impressive that in 1973, the fortress was officially declared a National Historic Landmark. 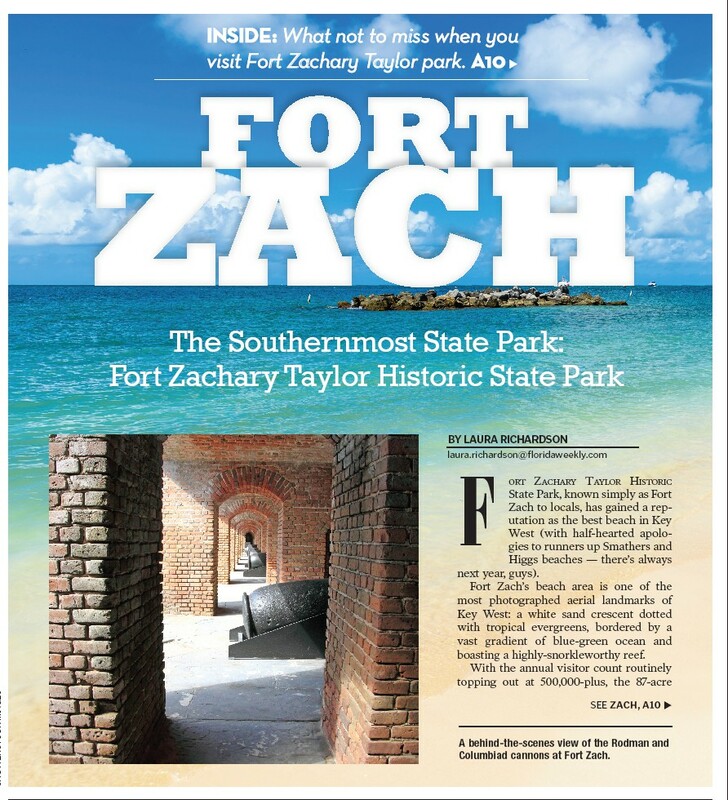 The state of Florida gained ownership of the property three years later, and after the erection of a visitors center, Fort Zachary Taylor Historic State Park opened to the public in 1985 as the southernmost state park in the continental United States. Today, the park continues to draw hundreds of thousands of tourists annually. And while the magnitude of its historic significance is surely enough to entice tourists to visit, its caregivers are passionately committed to ensuring the fort remains relevant. 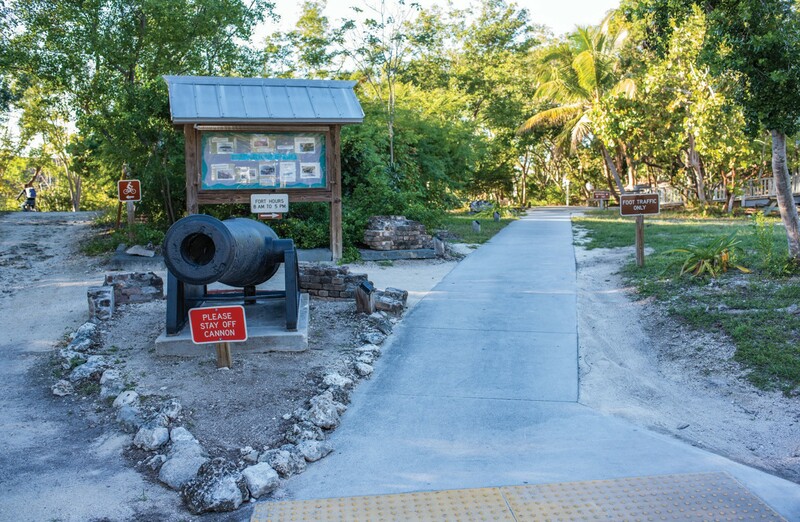 Though the relic of the building itself remains nonfunctional, it is the waters off Fort Zach beach that will ensure the park continues to defend and protect those under siege — in this case, the endangered coral reefs surrounding the Florida Keys. Mote Marine Laboratory, a coral restoration nonprofit headquartered in the Florida Keys, has for years dedicated itself to the study and restoration of the ocean’s vast and complex ecosystem. In 2017, a new partnership between the Mote lab, the Department of Environmental Protection, the Florida Keys Marine Sanctuary and Fort Zach oversaw the installation of 5,500 nursery-grown corals in the waters off Fort Zach beach, with the newly propagated pieces of previously rescued corals having been sourced from within the park itself, allowing Mote scientists the unique opportunity to return technically native corals to their home in a larger, stronger state after their rehabilitation at the Mote nurseries. The replanted coral habitat gives volunteer “citizen scientists” the chance to snorkel the growing reef alongside researchers during prearranged events, giving visitors up-close access to the project and its progress. With continued news on South Florida’s reef system reporting deterioration of the delicate coral is accelerating at a far greater speed than previously thought, scientists have begun warning the public that Florida’s barrier reef — the third largest in the world, and the only one in the continental United States — has reached a breaking point. However dire the circumstance, the fight to keep the destruction of coral reefs at bay nevertheless persists, including here in Key West. In 2013, the island’s residents scored an epic win on behalf of their reef when they arrived at the polls in record breaking numbers to vote down the potential dredging of a channel within the Florida Keys National Marine Sanctuary. According to many local politicians and business leaders, a bigger, deeper channel that would allow gargantuan cruise ships to access the island’s docks was vital to ensuring the prosperity of Key West’s multimillion dollar tourist-based economy. However, with Florida’s reef-based tourism and commercial fishing revenue estimated at more than $7.5 billion, Key West residents decided to bet on behalf of the ocean, and were recently offered a haunting glimpse of what could have happened if they had not been victorious: A similarly cruise-oriented dredging of Port Miami made national news in 2017 when it was revealed that, according to the National Oceanic and Atmospheric Administration, the dredging of the port caused extensive damage to the area’s coral reef, with an estimated 93 percent partial coral death due to sediment created by the dredging. For many Florida ports with dredging plans in the works, programs to relocate and rehabilitate nearby reef structures with nursery-raised corals such as the ones installed at Fort Zach are fast becoming part of the plan. At their research facility on Summerland Key, Mote scientists have revolutionized coral rehabilitation farming by selectively farming fragments of Staghorn corals — a dangerously threatened species — that scientists are able to identify as particularly resistant to the warmer, acidified waters now common throughout Florida’s reef. These specimens are able to regenerate at up to four times faster inside Mote’s Summerland Key extensive underwater nursery than they would in the wild, allowing scientists there to replant hardier specimens at a much faster rate than ever before. In addition to its ongoing coral restoration, Fort Zach recently unveiled a new $1.8 million brick entrance, replacing the aging ticket booths that previously welcomed visitors. Part of a larger series of multi-million dollar restoration projects completed last spring — including the construction of a state-of-the-art amphitheater — aimed at improving the infrastructure and amenities of the Truman Waterfront, the new entrance at Fort Zach seems more appropriately historic and substantial-looking, as befits the 16th most visited state park out of a whopping 171 nationwide.